Crispy pastries with spicy onion filling popularly known as Irani Samosa are so addictive that anyone would be hooked on their very first bite.These little samosas got their Irani tag as they are widely sold in the Hyderabadi Irani cafes. A sip of that silky Irani chai with a bite of Spicy irani samosa gives you that feel of heaven on earth for sure ! Making them at home from scratch isn't that tough, do give it a try. Mysore Pak / Mysore paa ! Approximately, after a 90 day hole up i'm back with a mouth melting traditional sweet dish. I know I've been lazying a lot these days but always try my best to make up to you guys. Mysore pak originally called Mysuru Paaka is a traditional sweet dish of South India originated in the kitchens of Mysore palace, "Mysore, karnataka state". Mysore pak, the delicious sweet preparation made using generous amounts of fat and gram flour is rich in its taste and aroma.This dessert is made in two variations,first is the slightly harder one with the holes and the other is the melt in mouth version invented by Sri Krishna sweets. Both look and taste equally good.Today i'm sharing the later version that is the Sri Krishna sweets Mysore pak renamed as Mysore Paa ! Being an Hyderabadi, Biryani has always played a key role.No matter where we go, whom we meet, People always talk about Dum Biryani and here is where the reality strikes in. I have never tasted the authentic Nizam Dum Biryani as we are vegetarians. Biryani has endless versions and methods of preparing it.It has no fixed recipe or thumb rule to follow. Vegetable Dum Biryani is a delicious assemblage of marinated vegetables & paneer, whole & ground spices, aromatic ghee & saffron , crispy & golden fried Onions and flavorful fluffy Basmati rice which no one can resist. 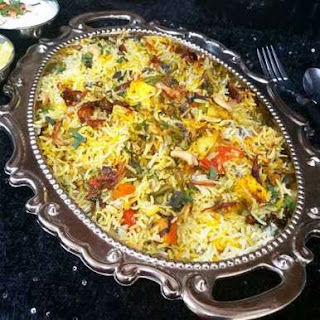 Here is a detailed description on how to make a restaurant style spicy Vegetable Dum Biryani. Are you tired of the regular kofta curries ? Well,then try this Raw Banana kofta curry. 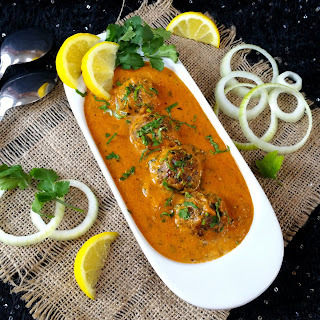 The shallow fried raw banana spinach koftas with a creamy (No cream) onion tomato based gravy is a thumb raise main dish that adorns any dinner table. The plantain replaces the role of paneer or potato in a healthy way providing an option for weight watchers and healthy freaks too. Banana is the humble breakfast fruit saved by Queensland scientists. Banana is s poor man's power house that calms down his hunger pangs instantly and also provides with multiple nutritional values that includes vitamin B6, minerals, dietary fibre and potassium. Banana is the only fruit eaten by majority of the lot and it is the only fruit available in abundance at just minimal price . 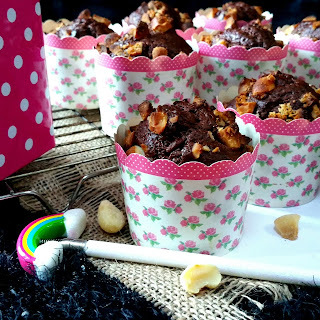 Making use of such healthy and rich fruit here i bring to you, the Deliciously soft and moist chocolate muffins loaded with the taste of banana, studded with chocolate chunks and macadamia nuts. It makes an instant hit at your parties and adorns any dinner table by its beauty.